The Islamic Development Bank honored the winners of the annual awards in the field of science and technology for the year 2017. The list of the scientific institutions that received the science and technology Award included the university of Indonesia , the faculty of Chemical engineering and Energy , Malaysia university of technology and the faculty of Medicine at university of Gezira in Sudan because it’s the most famous scientific institution in the least developed countries of the IDB group and to put a unique and innovative system and medical training. 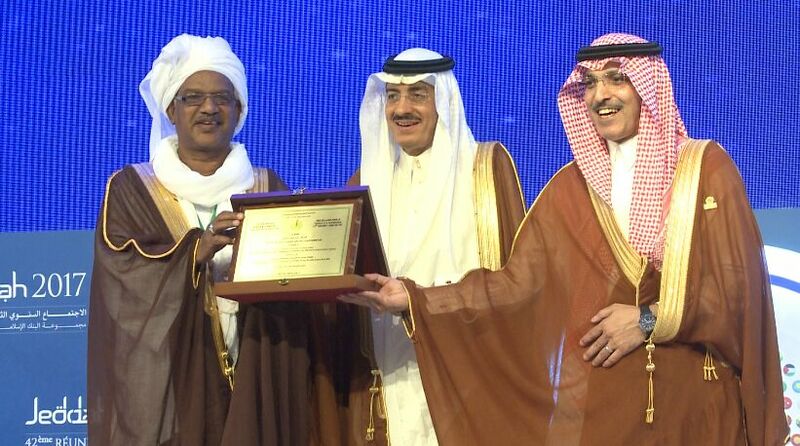 The ceremony was held on the sidelines of the 42 annual meeting of the board of Governments of the Islamic development bank which was held on 17 of May at the Hilton Hotel under the sponsorship of the king of Saudi Arabia Salman Bin Abd AL Haziz. A high delegation from university of Gezira represented in the vice challencer and his wife Prof Mohamed Warrag Omer , the dean of the faculty of medicine prof Haider AL Hadie , the chairman of the committee prof Ali Babaker Habour , prof Waded Mustafa AL Bushara and prof Salawa AL Sanose all those was participated in the celebration of receiving the Award. The development Bank in Jeddah has established its awards in the field of science and technology in the year 1422 -2001, in recognition of its interest and commitment to benefit from modern scientific progress to the benefit of the economical and social development of the members of the countries through appreciation and rewarding distinguished works and models of scientific , academic and research institutions. The awards that the bank awarded in science and technology aims to recognizing and encouraging the achievements of successful institutions in the field of science and technology in the members countries in order to push them to levels of excellence beside raising awareness among decision makers of current contributions and the future of science and technology in the process of sustainable development. The bank awards consist of three awards granted during the annual meeting of the board of Governors of the bank. Each award includes an amount of 100,000 US $ and a memorial plaque representing the name of the winning part and the achievement of the award and a certificate of appreciation. The awards are awarded to institutions that have made outstanding scientific or technical contributions to the social and economical development of any members countries and institutions that have made outstanding contributions to any of the scientific fields such as engineering , biotechnology , information technology, Optoe lectronics , Material Sciences , Pharmaceutical Sciences , Micro – Technology and alternative energy sources. The awards is also awarded to scientific research institutions which notable achievements in the least developed countries.